Description Freehold with vacant possession. Unconditional offers invited £750,000 exclusive, subject to contract. The Spa town of Royal Tunbridge Wells is highly sought after with great amenities and facilities. There is extensive shopping in Royal Victoria Place and Calverley Road with more specialist shops and boutiques in the historic Pantiles and High Street. There is a myriad of cafés and restaurants to suit all tastes and budgets throughout the town. The mainline station is within 0.7 miles of the property with a fast commuter service into London in under an hour, whilst the A21 provides good road links connecting to the M25 orbital motorway. Tunbridge Wells is well known for great schooling, both state and independent; there are grammar schools in the town, as well as church and comprehensive secondary schools, the nearest church/state primary school is the popular St James’. Independent schools in the area include Beechwood, Kent College, The Mead, Rosehill and Holmewood House. The town has a wealth of recreational venues, including the Assembly Hall and Trinity Arts theatres, local golf and tennis clubs, parks and open spaces. This prime location near to the town centre would attract high end sales values and rentals. We believe the site area is approx 0.25 acres. 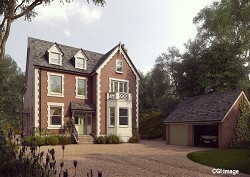 Planning consent has been granted for a substantial house arranged over four floors providing accommodation of approx. 550 sqm. Planning Reference TW/15/507389/FUL. Freehold with vacant possession. Unconditional offers invited £750,000. The site can be viewed at anytime. For further information please contact Bracketts – 01732 350503.